4.6 mile loop up and along a rolling rock-studded grassy ridge west of Danville. Las Trampas sings in spring -- lovely flowers and not too hot. Too hot in summer, but autumn is pleasant. Avoid during the wettest months because trails get mucked up by the cows. Bollinger Creek divides Las Trampas into two different plant communities. 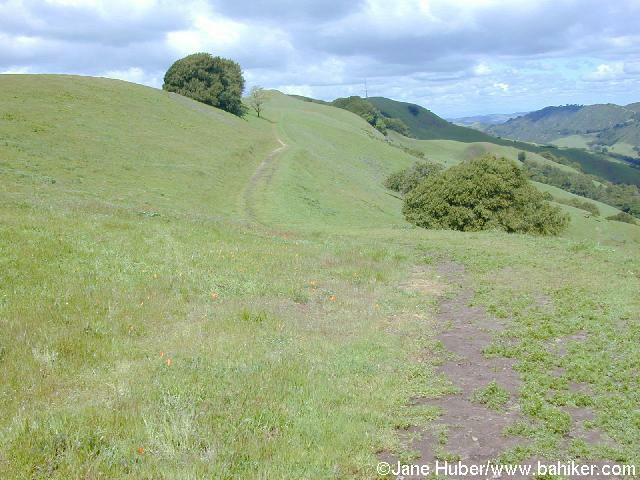 If you prefer chaparral to grassland, explore the eastern part of the wilderness, on trails up and down Las Trampas Ridge. Las Trampas is hike number 25 in 60 Hikes in 60 Miles: San Francisco (third edition). Read about this hike on BAHiker. Crane Creek is a tiny oasis on the eastern outskirts of Rohnert Park. Lose yourself in a landscape of grassland, graceful oaks, and a burbling stream, on this easy 1.1 mile hike.